It had all the trappings of a bombshell report. The German socialists turning against their conservative former allies – and running headlong into the open arms of Russia’s Vladimir Putin. There were secret meetings, armies of Internet trolls and “targeted” social media attacks. Still, despite the fusillade of juicy details, a story containing salacious allegations of Russian interference in German politics published by Bild, one of Germany’s most well-read newspapers, has been revealed to be a hoax organized by a German satirical magazine, which noticed that German media had been much more hesitant to blame Russia for election hacking than media in other Western countries. Germany’s Bild – which has a well-known anti-SPD stance and roots in the tabloid world – ran with the story, despite failing to double-check and verify claims that a leader in Germany’s Social Democratic Party had engaged in a conspiracy with a shadowy Russian hacker to organize a coordinated Russian disinformation campaign targeted at SPD leader Martin Schulz. Applying all their creativity, they forged a chain of fake emails resembling an exchange between Kevin Kuehnert, head of the Social Democratic Party (SPD) youth wing Jusos (and a prominent critic of the new coalition government with Angela Merkel’s conservative bloc), and a shadowy Russian bot master by the name of “Juri.” The fake material was then fed to Bild. Schulz, a former president of the European Parliament, stepped down from the leadership of the SPD earlier this month after announcing a controversial coalition deal with German Chancellor Angela Merkel’s Christian Democrats and their Bavarian allies the Christian Social Union. Schulz had also recently abandoned a bid to serve as Germany’s foreign minister following heavy criticism from his party. Given all the drama, the writers and editors at Titanic, a Germany monthly satirical magazine, found it odd that the German media had hesitated to blame Russia for meddling in their country’s political process – particularly given the strong showing of Germany’s Alternative for Germany far-right party that has advocated closer ties to Russia. So the editors decided to capitalize on the growing global hysteria about Russia and see if they could entice Bild – which they frequently criticize for having sub-par editorial standards – into publishing an embarrassing hoax with details seemingly cribbed from a spy novel, as RT reports. Editors of Titanic, a German monthly satirical magazine with a circulation of approximately 100,000, found it odd and amusing that the German media, including the top-selling Bild daily, for some reason hesitated to blame Russia for meddling in their country’s political process too.Capitalizing on the global ‘Russian meddling’ hysteria, they devised a ‘spy movie’ plot, a storyline that would feature a Russian ‘troll factory’ using social media bots to target German politicians. “There were no rumors of Russian meddling and we thought – ‘this cannot be’ – we have to make an alliance with the Bild tabloid and push a story of Russian meddling. And as we see now, it works perfectly,” Moritz Hürtgen, editor of Titanic, told RT. Upon receiving the forged emails, the editors at Bild apparently thought that they had finally stumbled upon hard proof of Russian meddling – a first among the German press. So what did they do? Instead of vetting the information, they rushed to press, publishing a story about the “new smear campaign inside the SPD” on Friday. It wasn’t until Wednesday that the paper retracted the story. It’s also now facing a lawsuit from Kevin Kuehnert, head of the SPD youth wing, who was identified as a conspirator in the story. 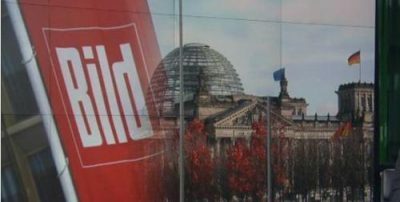 Although Bild is Germany’s most widely-read daily with a circulation over one million, ordinary Germans were unsurprised by the tabloid’s extremely lax standards. “I don’t believe that the Russians really do that, because the BZ and the Bild publish fake news very often. We here in Berlin know that already and that happens constantly,” Mohamed, a Berlin resident, told Ruptly. “I’m used to that. Bild publishes without checking, I mean, Bild is for entertainment, not for something serious,” another Berliner said.